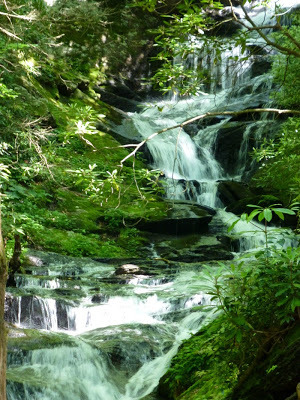 Now here’s a beautiful waterfall for you to see when you stay in our neck of the woods! 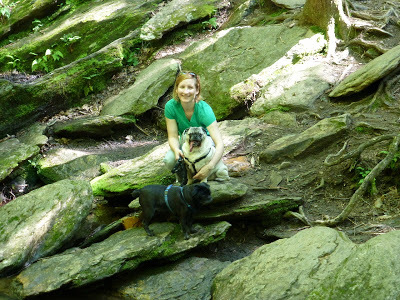 On Memorial Day weekend, we took Csaba and Bugsy the innpugs on an afternoon of hiking to a very nice waterfall located just north of the Blue Ridge Parkway in Yancy County, off of scenic Highway 80. 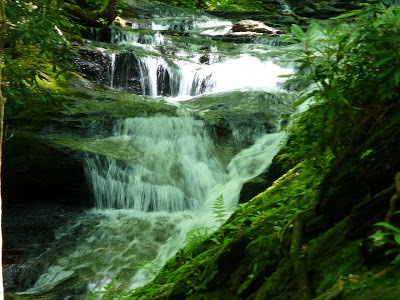 About 40 minutes from the Inn on Mill Creek is Roaring Fork Falls, which zig-zags over boulders on its way to a nice pool at the base of the falls. The hike to the falls begins to the right of the gated parking lot entrance of the Busick Work Center near the Mt. Mitchell golf course. 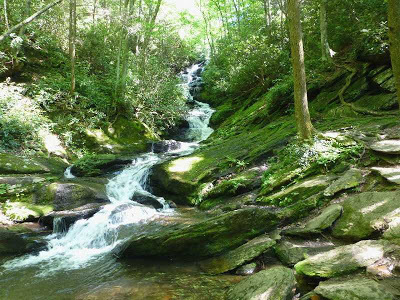 … you will begin to hear Roaring Fork (really a babbling brook), which is a tributary to the South Toe River. You’ll also see the remnants of what look like picnic tables and shelters. 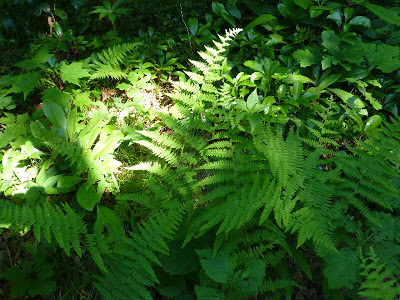 This is a nice, shady hike, perfect for the summertime. 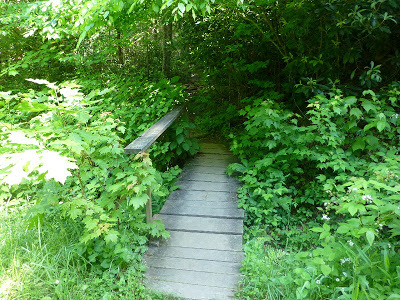 When you see the little foot bridge, you know you’re almost there. Just across the foot bridge is a short trail marked by tree roots, which leads to Roaring Fork Falls. The falls are very long, but not towering, perhaps 35-45 feet high from the top to bottom as they cascade down the rocks. The zig-zag of the falls is what’s really cool. Be sure to bring your camera — Mother Nature has etched out quite a few great spots for photos (be careful if you walk on the mossy rocks). To get to Roaring Fork Falls from the Inn on Mill Creek, take Highway 70 east from historic Old Fort and turn left on Highway 80. Highway 80 will take you 12 miles along a scenic route past Lake Tahoma and to the Blue Ridge Parkway. Cross over the Parkway on Hwy 80 and turn left after 2.2 miles, onto South Toe River Road. Almost immediately after crossing the bridge, turn left and go about a quarter-mile to the end of the road — the road dead ends at the Busick Work Center and you’ll see the trailhead on the right. Parking is available to the left of the gated entrance to the work center. 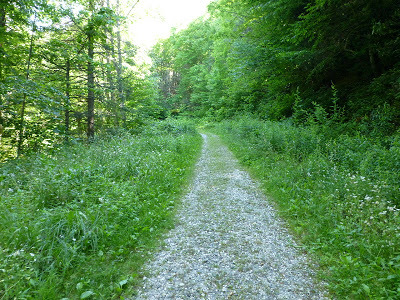 This entry was posted in Uncategorized and tagged Blue Ridge Parkway, hiking, Summer by Inn on Mill Creek. Bookmark the permalink.